Mix all chutney ingredients together and reserve. Prepare chutney while grill is heating up. Rub tenderloin with small amount of olive oil. Season with salt and pepper. Sprinkle with chili powder. Slice reserved pineapple into 1/2-inch thick slices. Grill pork tenderloin on all sides on medium high to an internal temperature of 150 degrees F. (approximately 10 to 12 minutes). While pork is grilling, grill the pineapple slices. Remove pineapple and pork and let rest for approximately 5 minutes. Lay down a bed of Mesclun greens. Shingle the grilled pineapple slices over the greens. 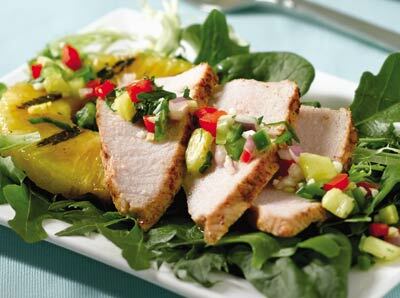 Slice pork on the bias in 1/4-inch thick slices and shingle in the center of the plate against the grilled pineapple. Spoon chutney over sliced pork.